We often go fishing with our grandfather and already visited lots of fishing spots across Ontario. Fishing requires lots of patience and to keep young kids busy we have to get something to entertain them for a long time. We bought Teddy a fishing rod to try but he likes to use it when fish takes the bait all the time. So we found another type of rods our child definitely will be excited about. It is Rocket Fishing Rod. Created for children ages 8 and up, it can teach them how to fish and make it fun too. 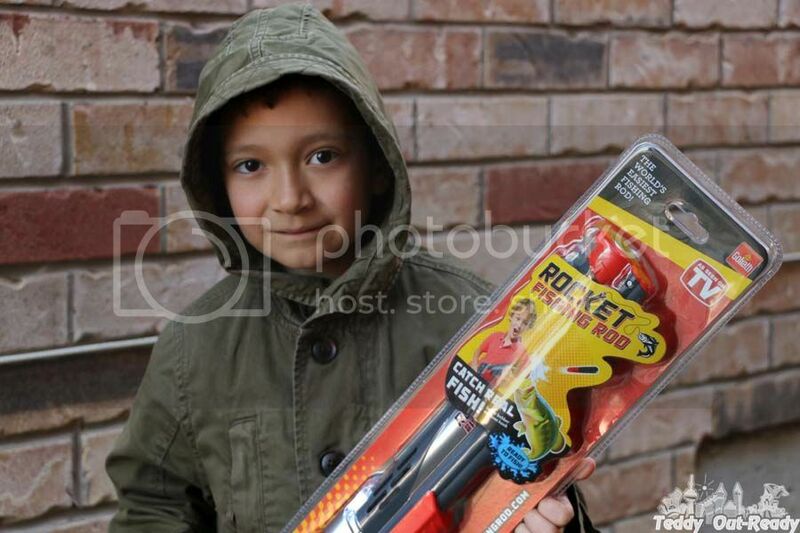 Though it looks like a toy, Rocket Fishing Rod is designed to catch real fish. It accurately casts its line up to 30 feet and has all necessary accessories to fish from hooks to lines, safety button and a special bobber. The hardest part for Teddy was to cast the rod's line. Often he could not do it properly. 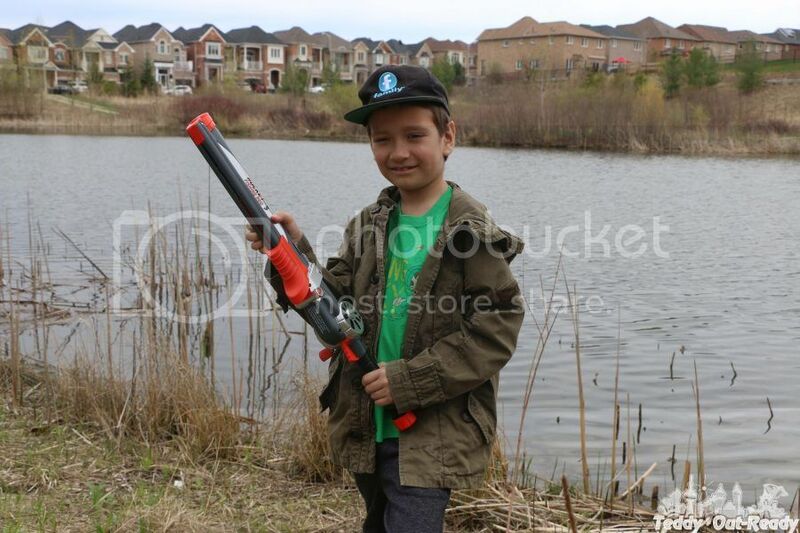 With Rocket Fishing Rod this problem is solved, it is cannon-like shooting brings more fun to our fishing adventures. The only thing kids should make sure they shoot towards the water, not people, pets or wild animals. Rocket Fishing Rod includes the safety bobber and hooks in the set. After you place bait on the hook, you need to put it inside the safety bobber and close it to conceal the hook. That way kids have less chances to hurt themselves and others when throwing the line into the water, because the hook is inside the safety bobber. The bobber opens and releases the bait automatically upon hitting the water. Regular fishing rods are hard to cast but with Rocket Fishing Rods it is easy to do. Just slide forward the red handle on the barrel of the rod and then pull back, it puts the safety bobble into the position ready to shoot. To launch the bobber just pull the trigger and shoot. 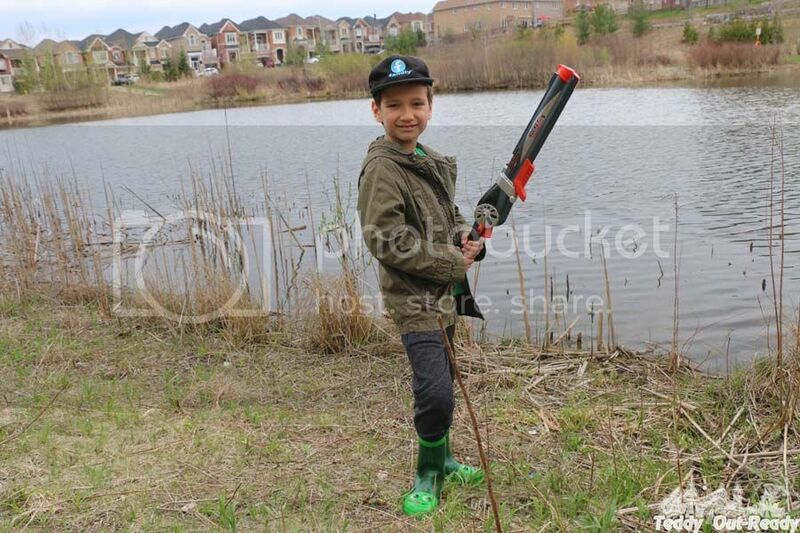 While Rocket Fishing Rod is easy to use, Teddy had some difficulties to adjust the line and reel in. When the line is long, it becomes like spider's web and hard to deal with. Otherwise, the Rod is fun to use. Our grandfather does not like it much saying it is not for serious anglers, but Teddy has a good time playing and shooting with it. He learns how to use hooks and reel in. It is so much fun and may be our experienced angers will change their mind when Teddy will catch a big fish using his Rocket Fishing Rod. We are looking forward to our fishing adventures! Rocket Fishing Rod is available on Amazon, Walmart, ToysRUs and other major retailers across in US and Canada. And remember, it must be used only with adult supervision. Love it I want one for my nephew.